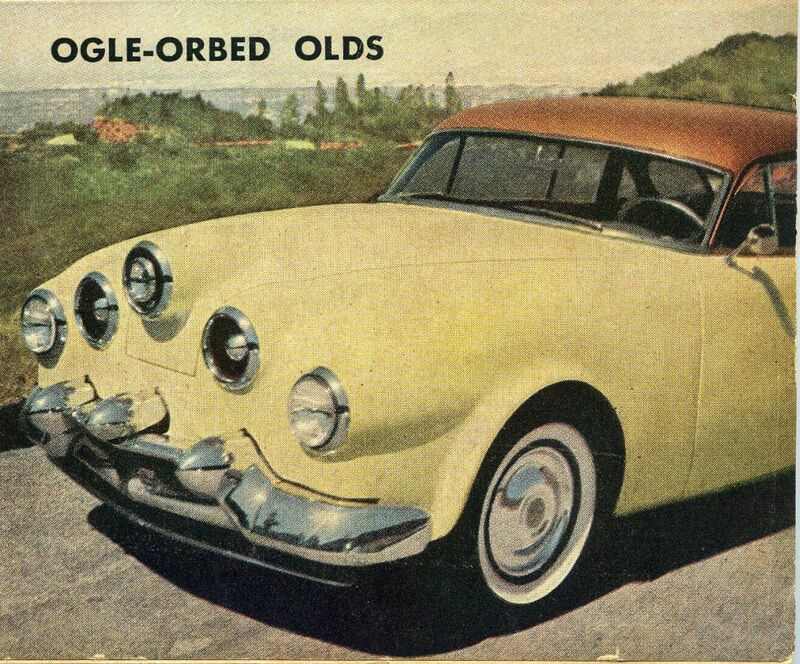 So far, I’ve found this custom car – the Ogle-Orbed Olds – in two Trend publications. 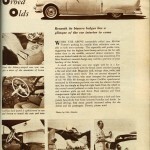 It first appeared on the cover – in color – along with a one-page article in the August, 1953 issue of Motor Trend. 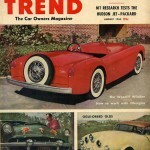 Next, it was seen – also on the cover and in color – in the Trend Book for Custom Cars published in 1954. 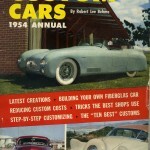 No accompanying article appeared in this 1954 Trend book for this car. 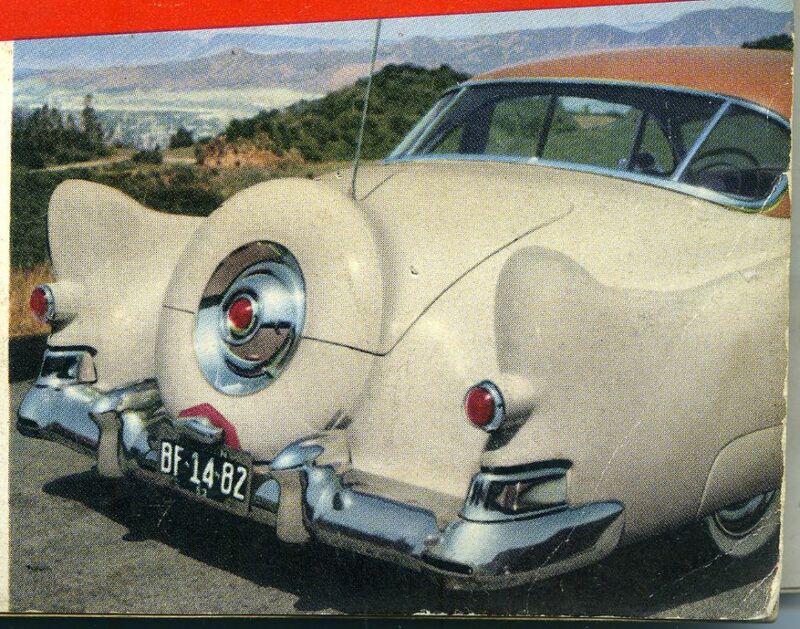 This car was famous, well-known, and on two covers – maybe more. I’m still researching this car and the person who built it. You’ll see why I’m highlighting this car shortly. When the above automobile rolled into Motor Trend’s parking lot, usually blasé onlookers were unable to hide their curiosity. The especially odd profile view, suggesting that the highest hood hump occurs on the far side rather than in the middle, attracted mixed comment. But when we looked inside the car, admiration was unanimous. 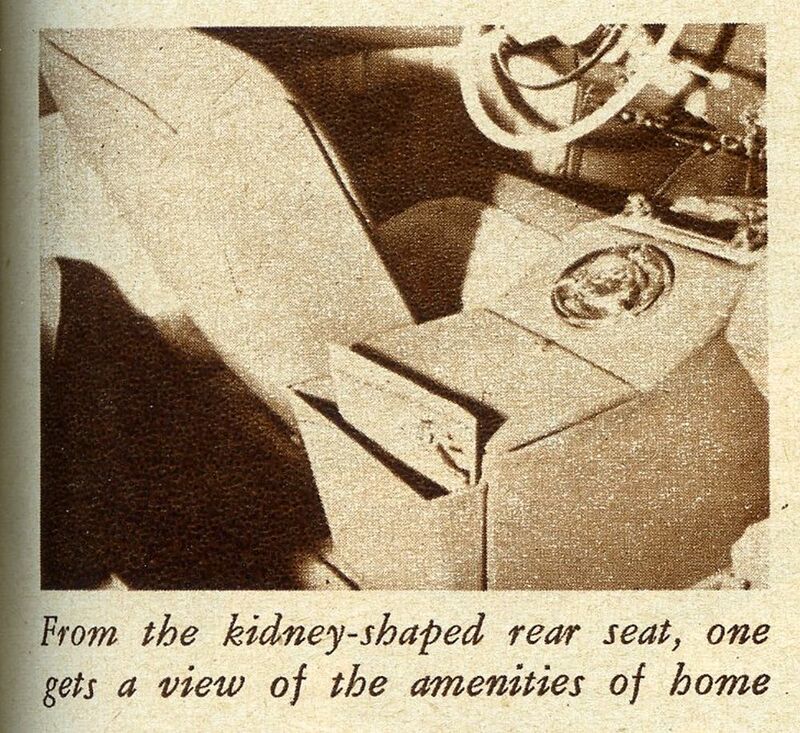 For Max Fleischer’s interior design may well be a preview of your hardtop of the future. A small and intimate rear seat might well be in a luxurious bar, particularly with the broad center armrest forming a flat and solid table. Magazine rack, storage chest, radio, and clock are within arm’s reach. Nor are matters skimped in the front. 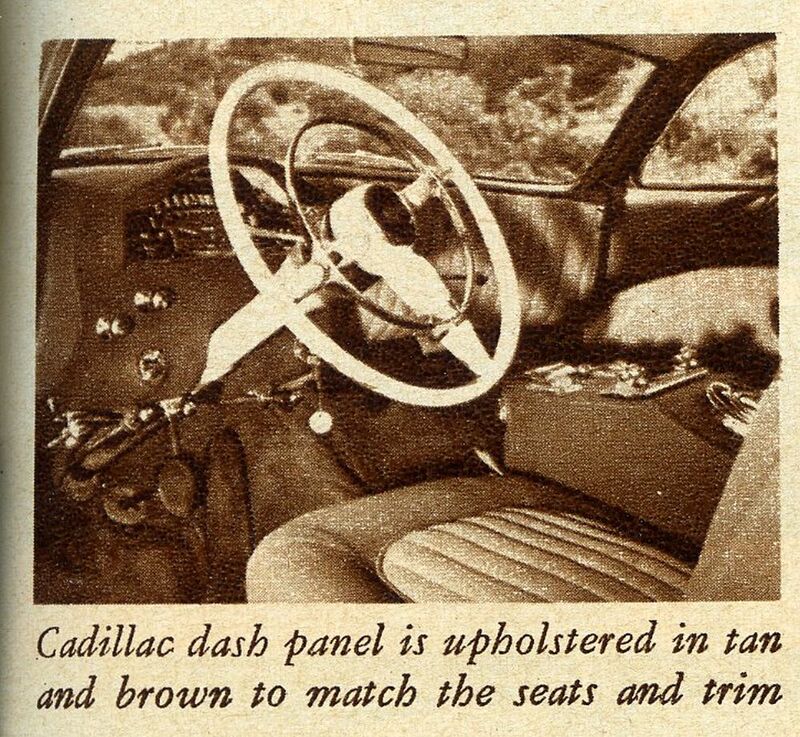 The driver, who must interpret the performance of his ’49 Olds 88 through an export Cadillac speedometer measured in kilometers per hour, not only has almost a bucket seat, but has simply to drop his right hand from the wheel to the central control pedestal to make doors and trunk fly open, and windows glide up and down. Dual ashtrays and front compartment lights are there too. To the eye, these centralized controls mean a dash and door panels beautifully free from scattered handles and knobs. In actual driving, they mean greatly increased safety for the driver and his passengers. Detroit, please note! Good friend Denny Leskey and his son Matt – both of Ionia, Michigan – shared some photos of this car with me several years ago. These photos show what happened to many of these special one-off cars during the years they fell into disrepair and no longer were heralded as achievements of their day. 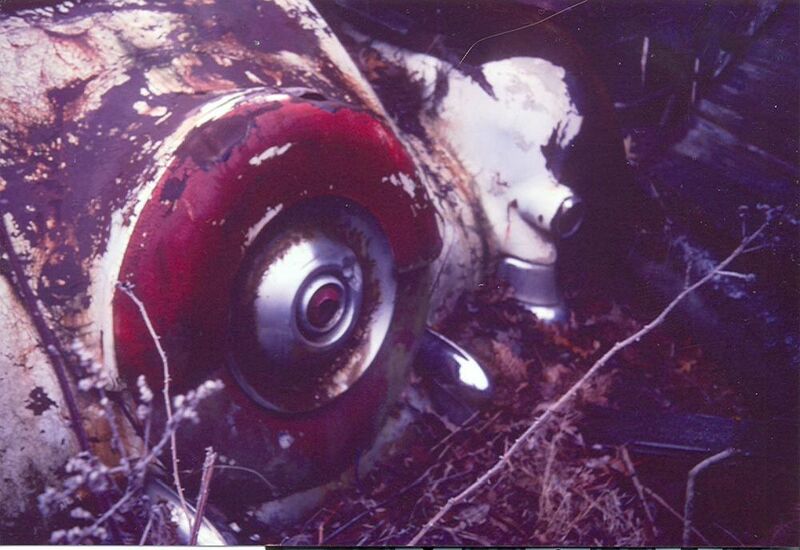 A sad sight to see, but let’s have a look at what Denny found in a Michigan junkyard in days gone by. Perhaps someone saved the Max Fleischer’s Ogle-Orbed Olds and removed it from the junkyard. 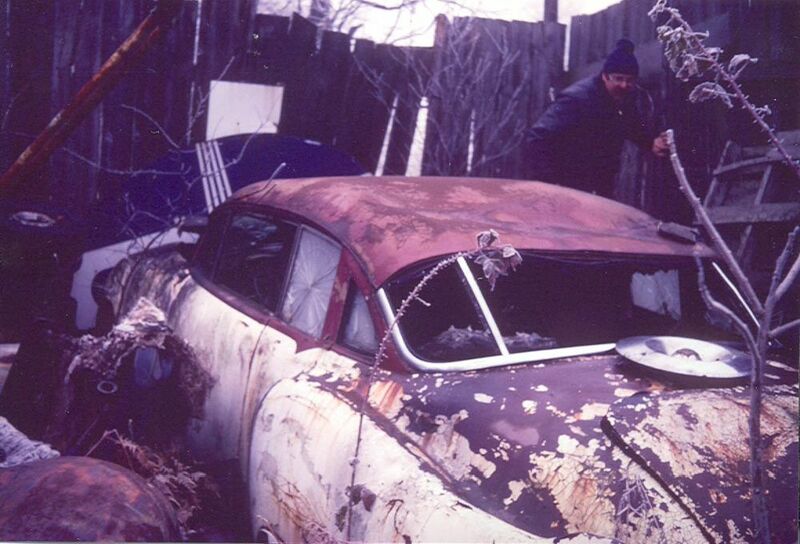 Calls to junkyards in the town that Denny remembered seeing the car – Chesaning, Michigan – were unsuccessful. But it was many years ago and it might be that he had the wrong town or I found the wrong yard to look in. It is hard to search in Michigan junkyards while I’m down here in Florida 🙂 Any of you “Michiganites” want to pick up the leads? 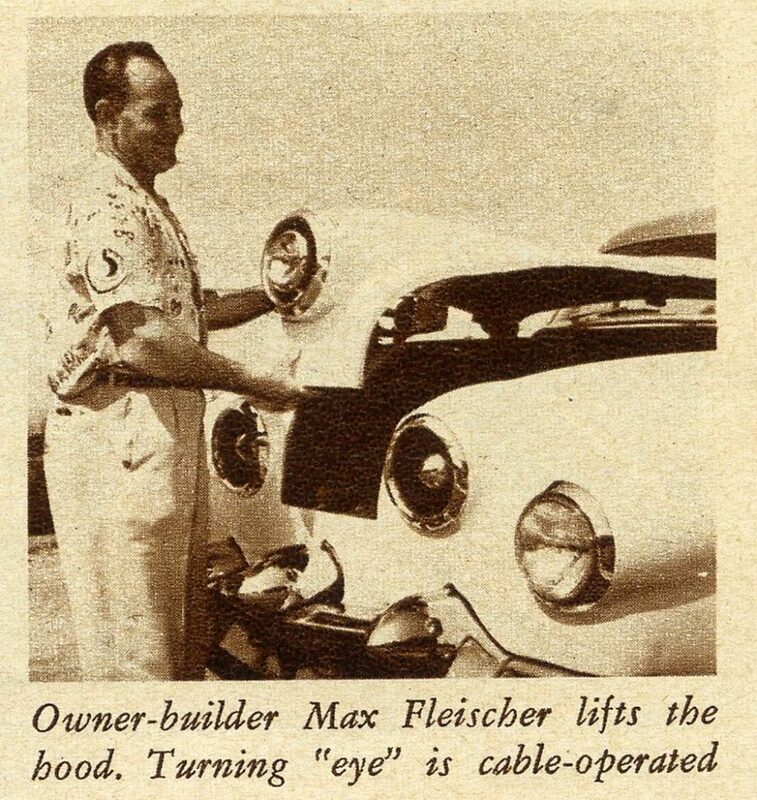 And what about the owner of the car – Max Fleischer? Max Fleischer was most likely from Michigan. I say that for two reasons. 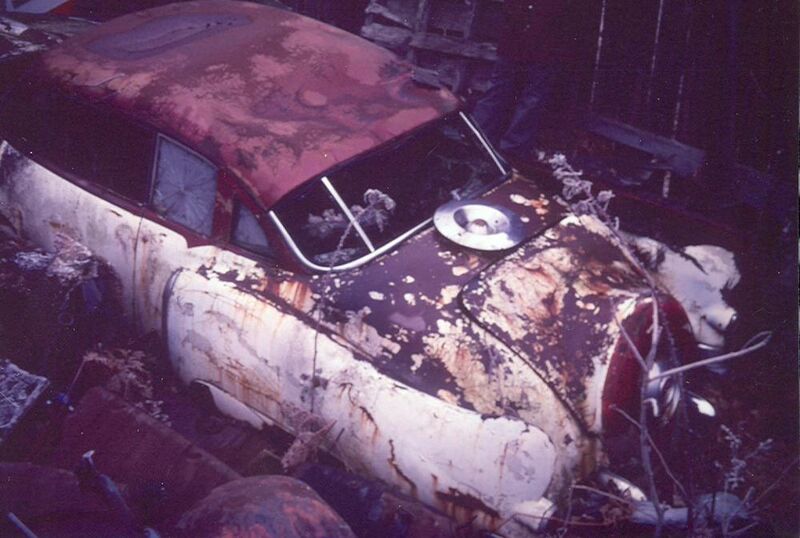 * First, the car was found by Denny in a Michigan junkyard. * Second, I’ve found another wild custom by Max and this was built in Detroit, Michigan. Not hard evidence, but it gives us a bit more to go on if and when the search begins for Max and his family – and perhaps the car. 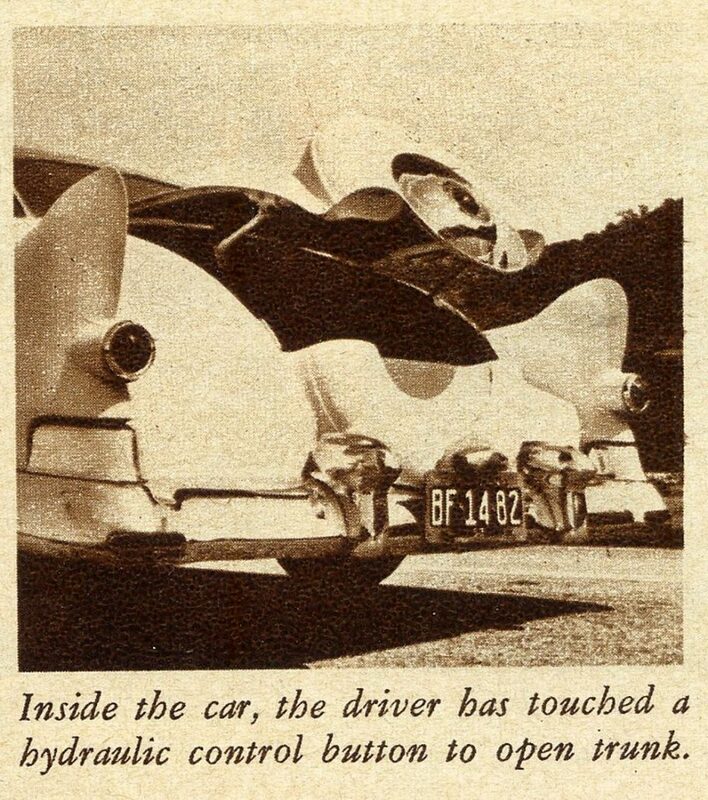 I’d love to know more about this cool custom from the early to mid ’50s, and see some excellent pictures of it…saved for posterity. 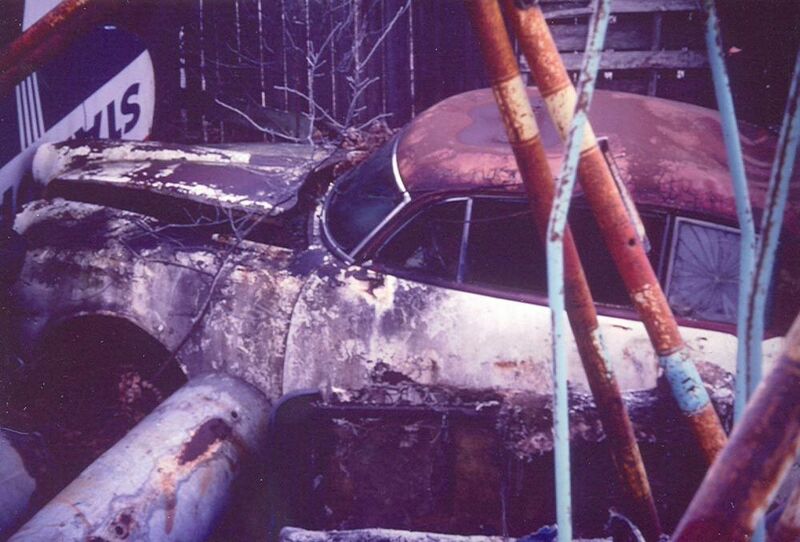 And…what if – years ago – someone saved the car from the jaws of the junkyard? (I’m forever the optimist). I’ve been known to have done that myself one, two, three, or maybe six times. 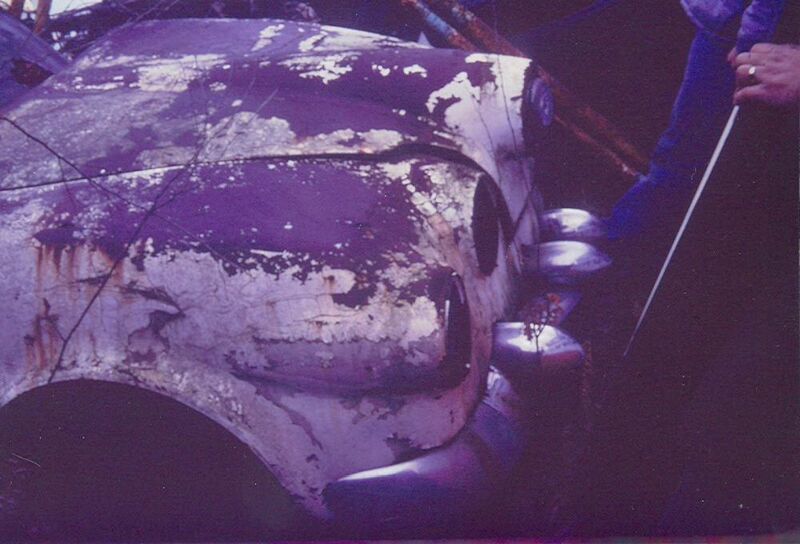 What fun it would be to learn the car was saved and restoration was in progress. So many possibilities here gang. You must be alluding to Max’s other GM upscale car. Lookinf forward to your coverage! The Fleischer Olds continues to cement the definition of “custom car” as having owner-defined preferences. I wonder if this Max Fleischer is any relation to the Max Fleischer of cartoon fame from the 30’s through to the early 60’s. He did the early Superman cartoons. Could explain the styling and interior. The ‘cartoon’ Max would have been 67 in 1950 so it is unlikely to be him. ~ it does have a bit of a Betty Boop vibe going for it, but i think it may be coincidence. 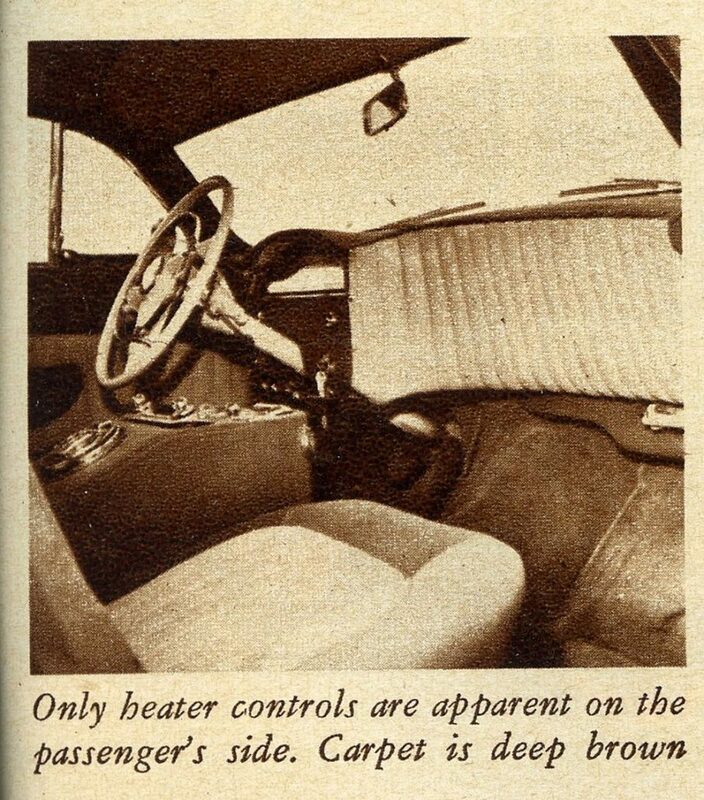 It was a custom car made up of a Buick LeSabre and a Studebaker parts and had a refrigerator that was cooled by the engine and was placed on either side of the motor to keep beverages cool This was also on one of the Motor Trend magazines. When I moved to Detroit I spent time at Max’s Auto repair and body shop on Grand River, his place was called Cadillac Body Service, he later moved the shop To Orchard Lake road in Farmington Hills Michigan. I photographed his 8 door Woody car in front of the Farmington Hills location, I am a professional photographer that lived and worked in Detroit for 30 some years and retired in 2002 to Phoenix AZ. 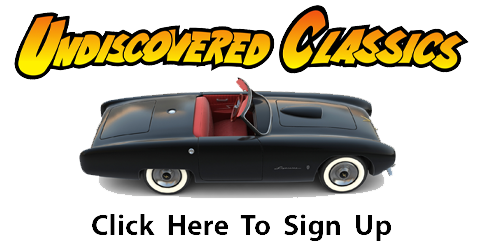 I hope you can find the missing part and all the details of Ogle Orbed Olds vintage car. I can’t wait to see the restoration of it to see the new one. I’ll wait for your next put up. Goodluck! Max was my father. At the time of Motor Trents publishing the article, Max was 52 years old. He past away in 1990 still owning the collision shop in Farmington Hills, MI. Alan Lowy is very correct with his info & no relationship to Max Fleischer, the cartoonist .